You can now buy a subscription to The Guardian and the Observer from the Kindle store, so for the vast majority of people this page is no longer useful. I'd encourage people who are using this service to subscribe to the official version instead, which is more complete and much more convenient. Thank you for your kind emails and comments about this project, which are much appreciated. Warning: this file is quite large (3.5M today), so if you're downloading this from your Kindle, it may take longer than you expect to appear on your home screen. 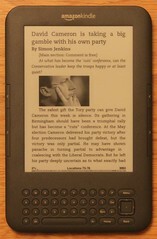 The script that generates this version of The Guardian or The Observer for your Kindle, using the Guardian Open Platform, is described in this blog post. The source code can be found on github.